It was a week of glorious battle! The air was filled with smoke and flying debris as jetpacks, missiles, lasers, and bullets fired. The ground was littered with the flaming hulks of massive bipedal war machines. I exploded and got exploded by a lot of mechs in a bloody quest to discover which flavor of mech warfare brings more glory and honor: newcomer Hawken or grizzled veteran Mechwarrior Online (MWO). Although free-to-play and still clinging to the “beta” status, both are open to new players and ready to take your cash in exchange for weaponized walking tanks. So, it has come to this: Which mech combat simulator will reign supreme? Click through the jump for full reviews! Graphically speaking, both games are similar. Sometimes, I even forgot which one I was playing as I switched between games. In both, the view during combat is pretty much what you’d expect in the cockpit of one of these beasts. The pilot is surrounded by health meters, speed gauges, minimaps, ammo counts, etc: Everything one needs to conduct war from a bucket seat. However, I like the cockpit in MWO better. The environment simulates sitting in a gyro-stabilized chair as the mech walks around. It feels more realistic. The sounds in either game are practically interchangeable. Between the two, there is nothing to differentiate the sounds of bullet pings, missile hits, explosions, or the metallic groan of armored robot legs. There’s nothing groundbreaking in the noises these games make. The sound design simply adds realistic ambience. The map venues for both are equally gritty and horrifically war-torn. Since MWO combat takes place in more open-field maps, weather effects and fog of war play a more significant role. It uses both to effectively dictate unit strategy, placement, and movement. These aspects are almost non-existent in Hawken, which features maps with more urban settings. There is no weather to speak of and the fog of war is replaced by the rising smoke and flying chunks of metal from the smouldering wrecks of your enemies. 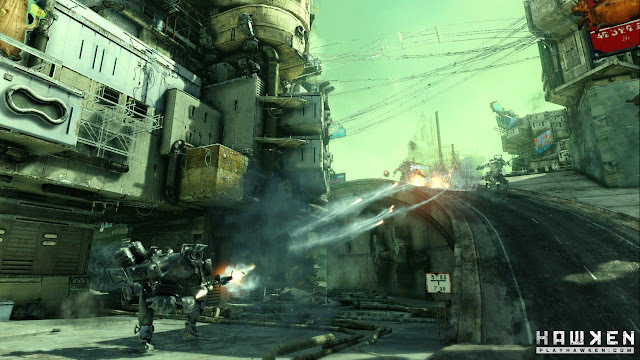 Hawken is better equipped in this arena with four ready-to-play game modes. Aside from the conventional deathmatch and team deathmatch, there are two other modes unique to the game: Missile Assault and Siege. Missile Assault is point capture with a slight twist. You have to acquire and maintain control of missile silos. Once these are held, they proceed to rain rocket hell on the enemy base. The more silos under your team’s control, the faster the enemy installation goes down. The Siege game is like no other scenario I’ve played on other shooters. It is a combination of point capture, resource gathering, and tower defense. The object of the game is to gather energy in order to launch your battleship. Once the ship is launched, it makes its way to the enemy base with the intent of bombing it to oblivion. If your team can maintain control of the anti-air array while the battleship is in the air, you can ensure longevity of the bombardment. It can take a few fully fueled battleships to completely annihilate the other team’s base. I played this mode more than any other in Hawken. In contrast, MWO comes with only two game modes: Assault and Conquer. Assault’s premise is simple: either kill all of the OpFor or capture their base. Conquer is point capture. Your team gathers resources by controlling resource points. First team to reach the resource goal is victorious. Alternatively, your team can wipe out the other team to win. There are no respawns in either mode. 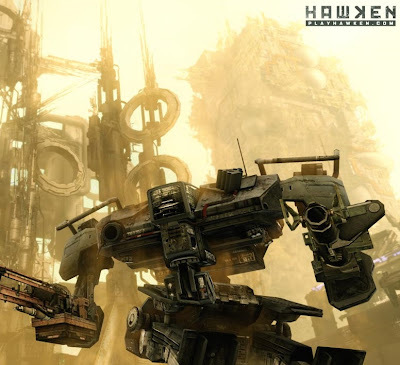 Hawken is much later in software development than MWO as evidenced by the wider variety of combat scenarios. However, Mechwarrior Online promises to bring more game modes to the table further down the line. At time of writing, Hawken wins this one. Gamers who are used to shooters should be able to jump right into Hawken. At its core, it is an FPS with a mech combat skin put on. You move just like you would in a regular FPS using the WASD keys and mouse-look. As you might expect, your motions are slower and the turning radius is wider than that of a standard shooter. You’re driving a big and heavy tank, after all. Jumpjets installed in every mech model adds another dynamic to gameplay in Hawken. They grant the walkers abilities to sprint, side-dash, jump, or hover. While fun, this creates an effect ought not be present in mech combat games: bunny-hopping. A multi-ton, walking hunk of metal with flames bursting out of its arse, bouncing around while circle-strafing you to death is a little silly. Sure, it’s fast-paced fun, but entirely unrealistic. On the other hand, MWO operates like a proper tank simulator. You still use WASD and the mouse to look but their functionality is vastly different. The W and S keys adjusts your forward and backward acceleration. They only control the speed. The mech doesn’t stop moving if you let go of those keys. A and D turn your legs, adjusting your heading. The mouse controls which way your torso is facing. Additional keys, X and C, are also constantly in use. The former instructs your vehicle to drop movement speed to zero; the latter aligns your torso with the direction your lower half is facing. With jumpjets only available to some models, you won’t see the map turned into a trampoline filled with robots. You’ll actually have to dodge multiple laser blasts and missile barrages on your feet. Tactics are better executed if considered ahead of time instead of on the fly, so you better put your strategery hats on. From a purist’s standpoint, MWO is the more accurate game. However, Hawken’s shooter-in-disguise approach to mechanized warfare doesn’t take away from its entertainment value. The verdict on this category depends on gameplay preference and what you might be in the mood for. Mechwarrior Online doubles the number of mech offerings available in Hawken. There are twenty combat-ready units in MWO. These are split up into five classes with four models per class. Hawken only has ten and they’re not nearly as organized. MWO’s weapon loadouts and options also vastly eclipse that of Hawken’s. There is a wider variety of weaponry to choose from and, depending on the mech’s class, a heck of a lot more mounting points to bolt weapon arrays into. The most mountpoints I’ve seen on a Hawken mech is three. The heavier units on MWO has five (and yes, I can fire everything at the same time while screaming “FIRE EVERYTHING!” into teamspeak). 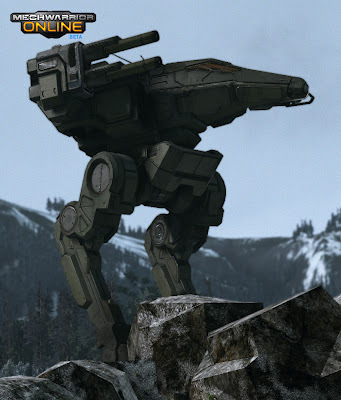 I would not bet on a Hawken mech going up against one from MWO unless the gravitational pull of the planet they’re fighting on is exceptionally low. Mechs have better aesthetics on MWO than on Hawken. The one you start out with on Hawken really didn’t sit well with me. It’s literally a box with attached arms and a windshield (with a wiper) mounted on legs. It looks like an old tube television on stilts. While the other mechs look pretty cool (those you have to purchase), they do not hold a candle to the refined and formidable appearances of the ones on MWO. The selection disparity does not come as a surprise. MWO is based on an IP that is almost thirty years old. As a result, they wipe the floor with Hawken in this category. The result of this comparison was unexpected. I am primarily an FPS player and naturally ended up playing Hawken more than MWO. When I decided to do this review, I thought Hawken was going to blow MWO out of the water because I found it more fun to play and has a wider selection of game modes. However, making a choice between these two games really comes down to what you’re in the mood for. If I was queuing up for a match by myself, I’d more than likely go with Hawken. It’s fast-paced action drops you right into combat. Even during team games, it has that every-man-for-himself feel to it because you get respawned when you die. This lessens the need to communicate with your teammates. On the other hand, MWO has no respawns and losing a unit in your artillery line can make the difference between winning and losing. The game’s tutorials stresses tight team communication as an ingredient to success. I would rather play this game with friends on teamspeak. So, even though MWO won more categories than Hawken, it doesn’t necessarily mean it’s the better game. Also, keep in mind that both games are in beta and each platform promises more future content. The outcome of a later comparison can be vastly different. In the end, I would recommend having both games installed. In Hawken, you can experience dropping your fast-moving, flying, armored vehicle on top of the hood of another while blasting it with TOW missiles. Alternatively, you can fire up MWO and grok the earth-thumping intimidation as one line of marching mechs crosses paths with another. Both scenarios are equally glorious and can provide honorable deaths for you or your vanquished foes. I like my mech games deep so I think I am going to try out MWO first. Thanks for the article! 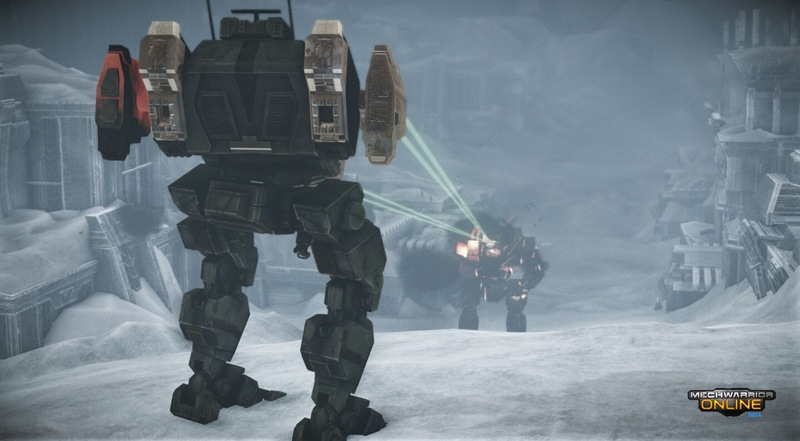 Compairing Mechwarrior to Hawken is like comparing a flight simulator to an arcade shooter. They are two separate game types with the same theme.